Sound and vision: Kouyoumdjian has become both a key technician in film sound and an award-winning director of music videos in Nova Scotia. 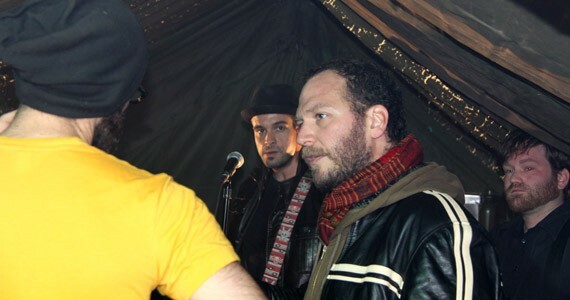 Aram Kouyoumdjian directs The Stanfields’ soldier song video. The film industry can be a tough way to make a living in Canada. It's sheer passion that drives many of its devotees to keep going. Aram Kouyoumdjian falls into that camp. "I've kind of just been floating through my career---I never went to school for this, I just work a lot," says Kouyoumdjian, who directed the video for The Stanfields' "Ship to Shore," off their 2010 album, The Vanguard of Young and Reckless, which won music video of the year at Nova Scotia Music Week in November. You've likely seen or heard of a production he's worked on: Hobo with a Shotgun and Picnicface's Roller Town are a couple recent local movies he's done sound mixing for. "I wear a lot of hats and put a lot of time and effort into my sound mixing career," says Kouyoumdjian, who has recently returned from New Brunswick, where he was working for five weeks on Phantoms, a CBC television movie. Sound mixing is usually seasonal work, most big productions don't shoot in the winter, but it's the "bread and butter" of his jobs, letting him pursue other projects, like The Stanfields' video. Kouyoumdjian's transition into the film industry happened by chance when he moved to Halifax from Moncton 15 years ago. He was working at a call centre and teaching guitar for extra money when one of his students offered him a gig as a production assistant. He "jumped ship" at the call centre and never looked back. It was a year-long stint with the TV series Lexx: the Dark Zone that led to work as a boom microphone operator. One gig led to another. After years of grunt work on sets, which served as on-the-job training, Kouyoumdjian wanted to direct a music video. "I'd been working in the business for a long time and at one point I just said, 'I can do that.'" He started with a video for The Senseamelia Project, Amelia Curran's band at the time. He now has his own production company, Roomtone Productions---for almost a decade, he's been working on music videos between other projects. "It's a little vehicle to tell a quick story," he says of the medium, comparing it to adding a soundtrack to a movie, but in reverse. He took this approach with "Ship to Shore," what he describes as a soldier's song. A modest budget---the anticipated $25,000 turned out to be $5,000---demanded improvisation. "Instead of building a jungle, we shot it on a green screen," he says, adding about a backdrop in one of the scenes, "Those are my house plants." No matter---they looks like abstract, stylized foliage. They went with it and tried to make it "look like a video game." From American productions---he's worked on one of the Jesse Stone TV movies starring Tom Selleck, and did sound mixing over the summer for the miniseries Bag of Bones, adapted from a Stephen King story---to local, indie projects, Kouyoumdjian's jobs have run the gamut. Occasionally, a gig sends him elsewhere. While working with The Lonely Planet series, he "literally just travelled the world for a year-and-a-half." In the midst of concocting numerous pitches, he's a little vague about his upcoming projects, but he has something in the works with musician Carleton Stone. He interrupts nearly every anecdote to emphasize just how much he enjoys what he does with his days and nights. "The line gets blurred," he says, "between what qualifies as life and free time and work."